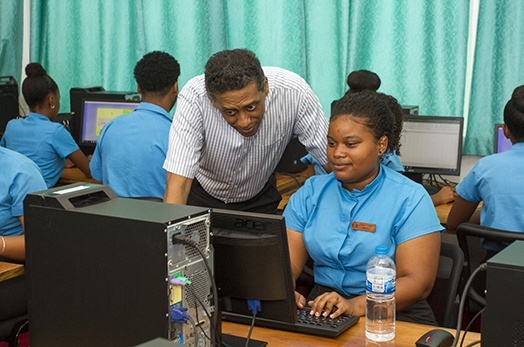 As a continuation of his series of visits to institutions, President Danny Faure visited two professional centres located at Anse Royale this morning including the Seychelles Institute of Art and Design (SIAD) and the Seychelles Business Studies Academy (SBSA). He also visited the Upper Secondary School of A levels (SALS). Whilst on the same campus the President also visited the University of Seychelles also located at Anse Royale. At the Seychelles Institute of Art and Design the President was welcomed by the Director of the Institute, Mrs Christine Chetty, and taken for a guided tour of the facilities of the institute where he had the opportunity to meet and interact with both students and lecturers. The President was able to also view some of the art on display by the students of the institute. The delegation then proceeded to the School of A Levels where President Faure was given a tour led by the Director, Mr Lester Omondi. The delegation present had the opportunity to observe some of the classes in progress as well as hold brief discussions with students. The President saw the Seychelles Business Studies Academy where he was welcomed by the Director Mrs Josianne Bristol. President visited both the administrative block as well as classroom which provided the opportunity to meet students and lecturers of the academy. Following the tour, a meeting chaired by the President was held in the theatre with the management of SIAD, SBSA and SALS. The meeting provided the three management teams the opportunity to share their successes, progress as well as challenges. The President commended the staff for their hard work despite the challenges. During his tour, President Faure also visited the University of Seychelles Campus. He was welcomed by the Vice-Chancellor of the University of Seychelles, Dr Justin Valentin, and the Unisey Registrar, Mrs Luciana Lagrenade, as well as other members of the faculty. As part of his visit the President visited both the academic facilities, administrative offices as well specialist rooms located on the campus. After the tour a meeting with the management team allowed the President to have a broader overview of both progress and future plans of Unisey. He thanked them for playing a key role in the socio-economic development of the country in relation to capacity building and training and urged them work closely with all relevant stakeholders to ensure the University attains its objectives. Leaving the UniSey Campus, the President also stopped by the Youth Hostel which provides accommodation for students from Praslin and La Digue undertaking further studies on Mahe. He was welcomed to the premises by the Hostel Manager Mr Roger Alphonse. The Youth Hostel, which is celebrating 20 years of its existence this year, currently houses 138 students and has a total of 10 staff. The visit was an opportunity for the President to view first-hand the infrastructural conditions of the Hostel, discuss maintenance and renovation plans as well options to expand and in future accommodate more students. The President visited both the male and female quarters after which he had the opportunity to meet with the management team present for an overview of progress, plans to upgrade certain facilities that will in return ensure students are housed in a venue that is comfortable and is conducive for learning. The President commended the team for ensuring the hostel has operated smoothly for the past 20 years.